This is another recipe from a cookbook at the museum I work at, this one from Sharing Recipes: A Book of Favorite Recipes Compiled by the Ladies Auxiliary of the Veterans of Foreign Wars, State of Wyoming. 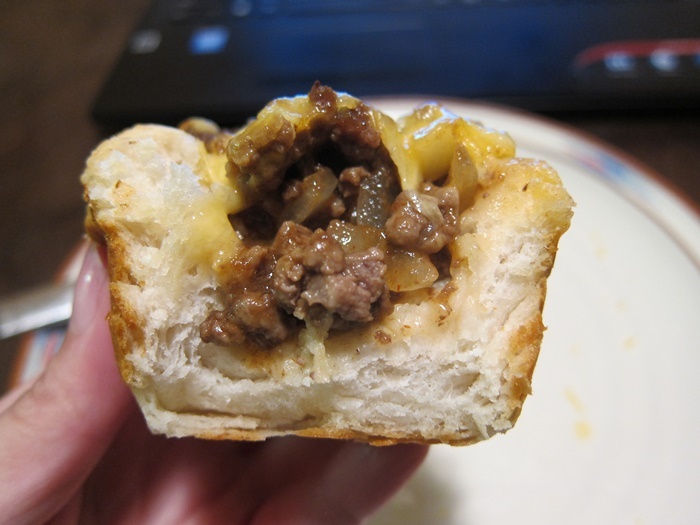 It’s decidedly not fancy, but it’s very tasty, easy, and kind of fun. I used (and I think they may have intended?) 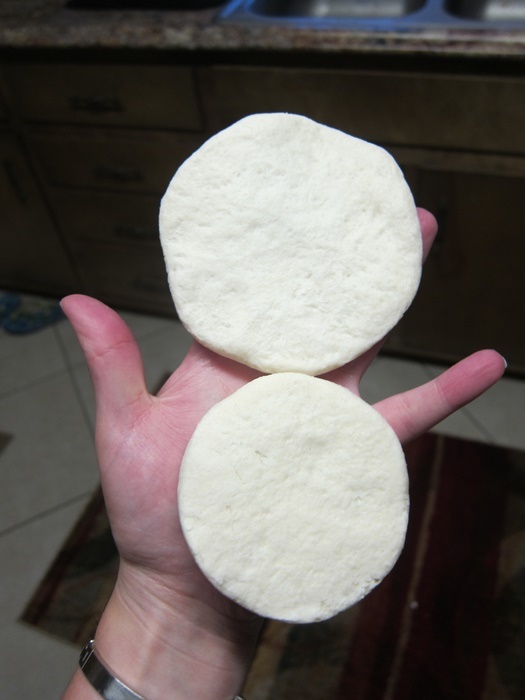 canned/refrigerated biscuit dough. I made it a second time with biscuits from scratch, but definitely preferred the version with canned dough. Because the recipe makes enough filling for 12, but tubes of dough only come with 8 biscuits, you’ll want to either cut the filling down by 1/3, or (better) use 1 1/2 cans of dough, and use the other half for something else. If you make them with the canned dough, they come out of the pan much easier, and hold together well all the way through the last bite. 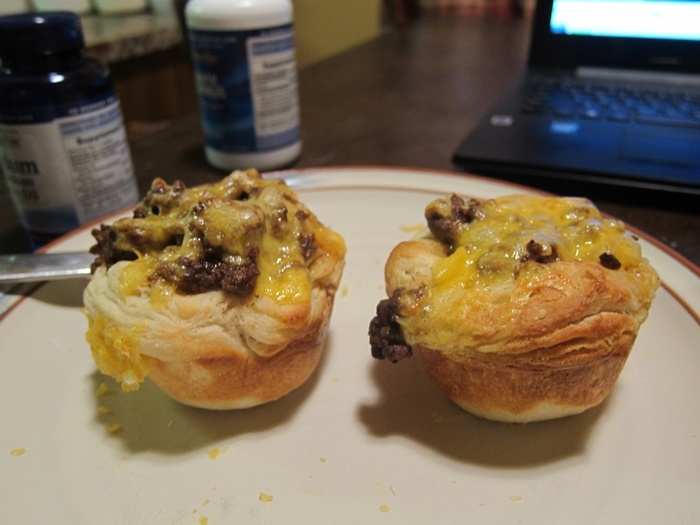 Grease a 12 cup muffin tin and set aside. Preheat oven to 400 degrees. Heat the oil in a pan over medium heat. Add the onion and cook until it begins to soften. Add the beef and cook until browned. Remove from the heat and stir in the brown sugar and bbq sauce. 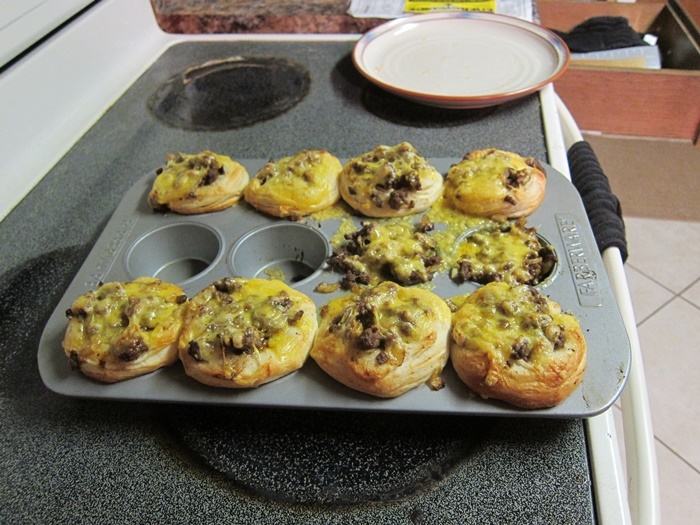 One at a time, squash the biscuit dough flat and place in a muffin cup. 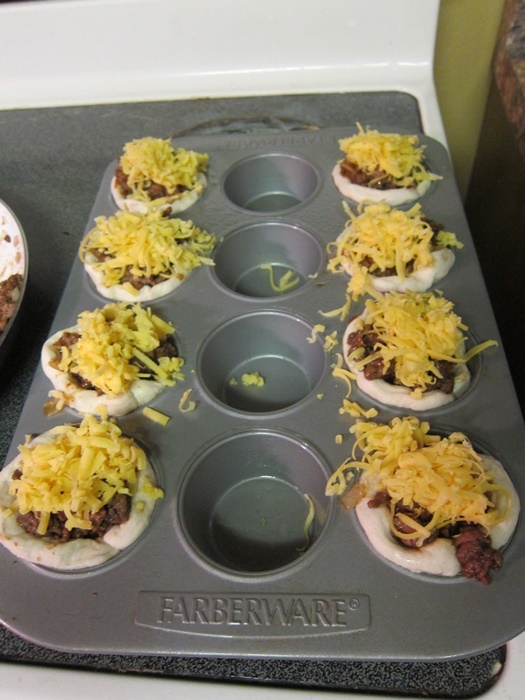 Fill each with the ground beef mixture, then top with cheese. Bake 15-20 minutes, until what you can see of the biscuits is browned. Pop out of the tin and enjoy. Adapted from from Sharing Recipes: A Book of Favorite Recipes Compiled by the Ladies Auxiliary of the Veterans of Foreign Wars, State of Wyoming. Heat the oil in a pan over medium heat. 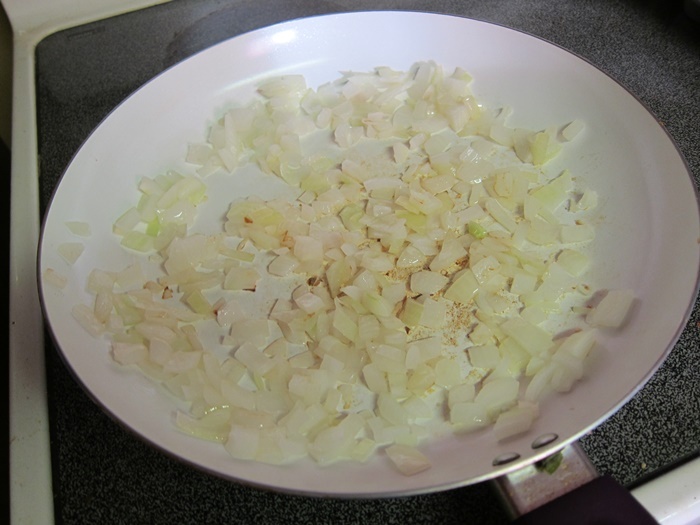 Add the onion and cook until it begins to soften. Add the beef and cook until browned. Remove from the heat and stir in the brown sugar and bbq sauce. 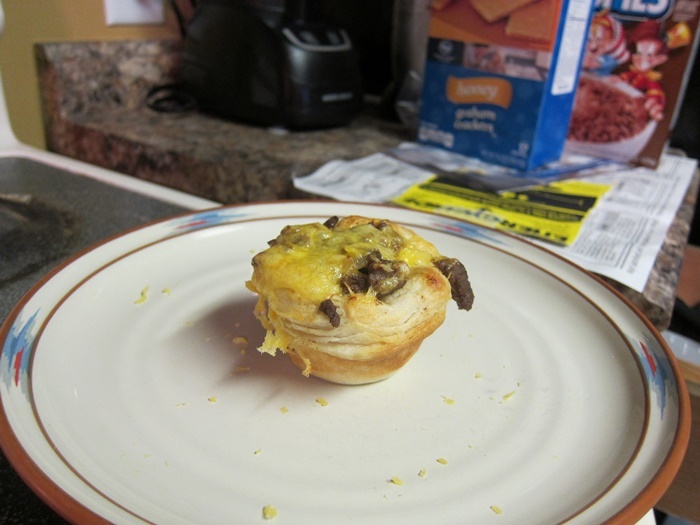 One at a time, squash the biscuit dough flat and place in a muffin cup. 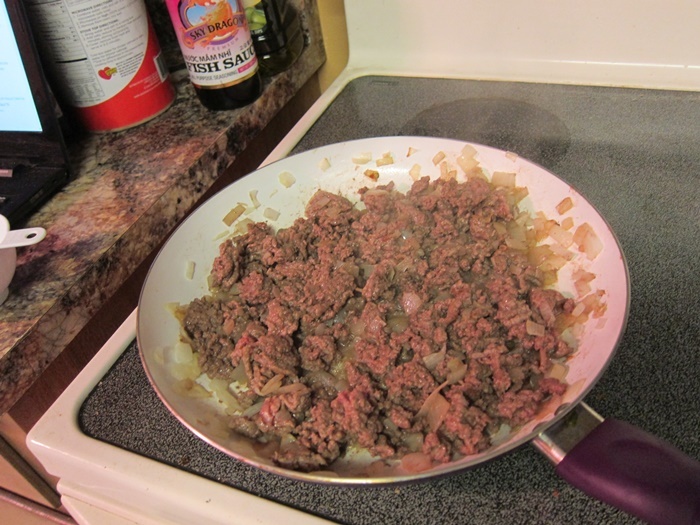 Fill each with the ground beef mixture, then top with cheese. Bake 15-20 minutes, until what you can see of the biscuits is browned. Pop out of the tin and enjoy. This entry was posted in Dinner and tagged bbq sauce, Beef, biscuits. Bookmark the permalink.